A parking probe has revealed which are the most hostile streets for Scarborough Council’s wardens to patrol. An ex-warden has told The Scarborough News the town is “nothing short of a nightmare” to patrol, with our investigation revealing that on average, an enforcement officer is attacked every month. As wardens face the backlash of the borough council’s car parking fines strategy, our revelations come after another driver was convicted of racially abusing a warden who is Polish. Frustrated Ian Hakings felt so “peeved” after finding a ticket slapped on his Fiesta he volleyed a stream of abuse at the warden. Magistrates criticised the 47-year-old benefit claimant for his tirade against the warden, who they said was simply “doing the job” the council hired him for. Scarborough Council say public hostility towards wardens has to stop, while one former enforcement officer says: “I can’t think of a more thankless job. “I was spat at, swore at him, started on – there’s a point in which you have to go ‘look, this isn’t worth it’. His comments come after a Freedom of Information request showed that in recent years, dozens of violent and verbal attacks have been committed against wardens. 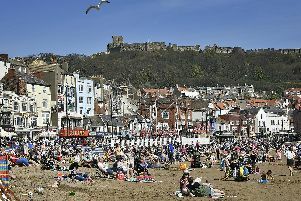 The investigation found that St Nicholas Cliff was the most dangerous Scarborough street for wardens, with around one in seven attacks taking place there. There have also been multiple attacks in Princess Square, Eastborough and Belgrave Terrace – although only a handful of incidents occurred in big car parks such as North Street or Whitby’s West Cliff car park. But it was Gordon Street in which Hakings lashed out on May 9, with the whole incident caught on the warden’s bodycam. That footage wasn’t shown at Monday’s Scarborough Magistrates’ Court hearing, but a transcript read out by the prosecution revealed Hakings had used a string of four-letter words while highlighting his ethnicity. The Barrowcliff Road man had stormed towards the warden after he’d fined him for parking on double yellow lines. “(The warden) felt uncomfortable and didn’t know what to do,” said the Crown Prosecution Service solicitor. And his temper flared up again in court, yelling “it’s going to be damaging to me that it’s going to be in the paper that I’m a racist” after making a claim that Scarborough Council had since scrapped his ticket. The council wouldn’t comment on that claim, but Stuart Clark, Scarborough Borough Council Parking Manager, said he was “pleased” to see the case brought to court. “We take a very dim view on any assaults, whether they are physical or verbal, against our staff and welcome action against the perpetrators,” he added. “Family man” Hakings, whose previous convictions didn’t include anything racial, admitted the attack but can’t do unpaid work as punishment due to claiming employment support allowance. Sentencing him to a community order, magistrates billed him £485 for the “totally unacceptable” attack, including £50 to his victim.